587 Lower Prince Mountain Rd. Long Range year round mountain views! 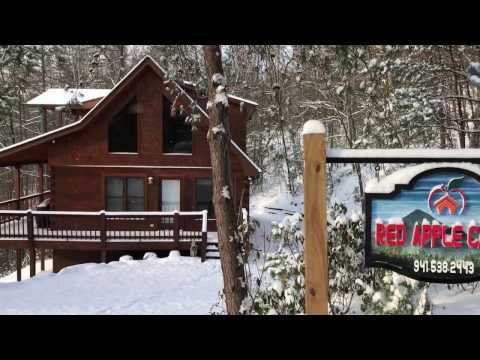 Red Apple Cabin is perched on Prince Mountain within the Cohutta National forest and adventure area. 2,100 feet of elevation lends to cool mountain breezes and crisp clean air as the wind brushes through the rustling leafs. Paved roads wind you to the base of Prince Mountain and then a short run up the gravel road to the end, solitude. Easily accessible by all cars. Plenty of parking space. Every room comes with a view of the mountain range and forest. Warm gas fireplace to gather by plus central heat and air conditioning! Wake up to silence with no other cabins in sight. 2.2 acres of buffer for this cabin. Master bedroom upstairs with oversize garden bathroom equipped with Jacuzzi tub and separate shower. Private owners porch just off the south face. Guest bedroom on the main floor with another oversize full bath and full size laundry services. Lower basement level provides a third bedroom, great for letting the family loose to explore and play.